I do not do taxes....Can I still sign up to refer people and make money? Yes.... You can sign up with us. We will accept anyone who sign up with us. You will be paid after your referral has agreed & paid us to let us represent them. How much do I make per referral? How will I get paid for my referrals? 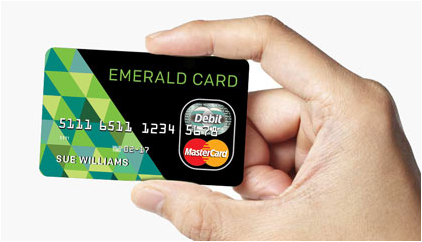 We will issue you a Emerald MasterCard Debit Card with your referral pay on it. Do I get a different pay card with every referrralee that pays? We will always upload your referral pay onto the same card that will be issued to you. Would I be an employee? No you will not be considered as an employee. You will have to fill out a W-9 form after we have paid you for 3 Paid Referrals. What is a customer referral? This is someone who you have referred to us. What is a Paid Referral? We have agreed to help the referralee with their tax situation and they have paid the agreed consultation fee to us. We in turn will make a Referral Pay to you. Who pays the taxes on the commission amount from the Paid Referral? You are responsible for paying your own portion of taxes for any amount that you receive from us. We will issue you a 1099 the next proceeding tax year by January 31st. What do I need to do to refer someone? We recommend that YOU fill out the form on www.YourTaxProblems.com . This will ensure the referral has been entered into our data intake system correctly. How can I see my referrals? creating a solution for their tax situation. I'm a tax professional, will I loose my client? No....Your client will always remain your client. We are only here to offer your client their options of Offer in Compromise with the IRS in lowering their tax amount. I need marketing materials, do you offer them? Yes... we do have marketing materials to offer you they are 4" x 6" postcards they are $25.00 for 100 postcards. You will get label stickers with your name and contact information on them. Can I get my own marketing materials? Yes... You can order your own marketing materials. We would prefer you use www.MWMarketingStrategies.com they are a preferred vendor. Who can I contact for questions about anything? ​Make as much money you want to make with our Payout Referral System. have been contacted by Business Services Today.